Addison’s disease, also known as primary adrenal insufficiency and hypocortisolism, is a long-term endocrine disorder in which the adrenal glands do not produce enough steroid hormones. Symptoms generally come on slowly and may include abdominal pain, weakness, and weight loss. Darkening of the skin in certain areas may also occur. Under certain circumstances, an adrenal crisis may occur with low blood pressure, vomiting, lower back pain, and loss of consciousness. An adrenal crisis can be triggered by stress, such as from an injury, surgery, or infection. Death may occur without treatment. Addison’s disease affects about 0.9 to 1.4 per 10,000 people in the developed world. It occurs most frequently in middle-aged females. Secondary adrenal insufficiency is more common. Long-term outcomes with treatment are typically good. It is named after Thomas Addison, a graduate of the University of Edinburgh Medical School, who first described the condition in 1855. The adjective "addisonian" is used to describe features of the condition, as well as people with Addison’s disease. The signs and symptoms include fatigue; lightheadedness upon standing or difficulty standing, muscle weakness, fever, weight loss, anxiety, nausea, vomiting, diarrhea, headache, sweating, changes in mood or personality, and joint and muscle pains. Some patients have cravings for salt or salty foods due to the loss of sodium through their urine. Hyperpigmentation of the skin may be seen, particularly when the patient lives in a sunny area, as well as darkening of the palmar crease, sites of friction, recent scars, the vermilion border of the lips, and genital skin. These skin changes are not encountered in secondary and tertiary hypoadrenalism. Addison's disease is associated with the development of other autoimmune diseases, such as type I diabetes, thyroid disease (Hashimoto's thyroiditis), and vitiligo. The presence of Addison's in addition to one of these is called autoimmune polyendocrine syndrome. Adrenal destruction is also a feature of adrenoleukodystrophy, and when the adrenal glands are involved in metastasis (seeding of cancer cells from elsewhere in the body, especially lung), hemorrhage (e.g., in Waterhouse-Friderichsen syndrome or antiphospholipid syndrome), particular infections (tuberculosis, histoplasmosis, coccidioidomycosis), or the deposition of abnormal protein in amyloidosis. Metabolic acidosis (increased blood acidity), also is due to loss of the hormone aldosterone because sodium reabsorption in the distal tubule is linked with acid/hydrogen ion (H+) secretion. Low levels of aldosterone stimulation of the renal distal tubule leads to sodium wasting in the urine and H+ retention in the serum. 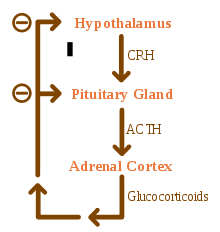 In suspected cases of Addison's disease, demonstration of low adrenal hormone levels even after appropriate stimulation (called the ACTH stimulation test) with synthetic pituitary ACTH hormone tetracosactide is needed for the diagnosis. Two tests are performed, the short and the long test. It should be noted that dexamethasone does not cross-react with the assay and can be administered concomitantly during testing. Adrenoleukodystrophy, and the milder form, adrenomyeloneuropathy, cause adrenal insufficiency combined with neurological symptoms. These diseases are estimated to be the cause of adrenal insufficiency in about 35% of male patients with idiopathic Addison’s disease, and should be considered in the differential diagnosis of any male with adrenal insufficiency. Diagnosis is made by a blood test to detect very long chain fatty acids. Corticosteroids to replace cortisols not secreted by the adrenal glands. Treatment for Addison's disease involves replacing the missing cortisol, sometimes in the form of hydrocortisone tablets, or prednisone tablets in a dosing regimen that mimics the physiological concentrations of cortisol. Alternatively, one-quarter as much prednisolone may be used for equal glucocorticoid effect as hydrocortisone. Treatment is usually lifelong. 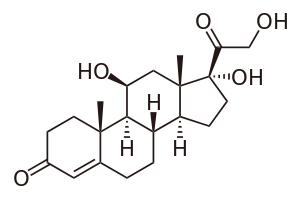 In addition, many patients require fludrocortisone as replacement for the missing aldosterone. People with Addison's are often advised to carry information on them (e.g., in the form of a MedicAlert bracelet or information card) for the attention of emergency medical services personnel who might need to attend to their needs. It is also recommended that a needle, syringe, and injectable form of cortisol be carried for emergencies. People with Addison's disease are advised to increase their medication during periods of illness or when undergoing surgery or dental treatment. Immediate medical attention is needed when severe infections, vomiting, or diarrhea occur, as these conditions can precipitate an Addisonian crisis. A patient who is vomiting may require injections of hydrocortisone instead. Standard therapy involves intravenous injections of glucocorticoids and large volumes of intravenous saline solution with dextrose (glucose). This treatment usually brings rapid improvement. If intravenous access is not immediately available, intramuscular injection of glucocorticoids can be used. When the patient can take fluids and medications by mouth, the amount of glucocorticoids is decreased until a maintenance dose is reached. If aldosterone is deficient, maintenance therapy also includes oral doses of fludrocortisone acetate. Individuals with Addison's disease has more than a doubled mortality rate. Furthermore, individuals with Addison's disease and diabetes mellitus have a almost 4 time increase in mortality compared to individuals with only diabetes. Addison’s disease is named after Thomas Addison, the British physician who first described the condition in On the Constitutional and Local Effects of Disease of the Suprarenal Capsules (1855). All of Addison's six original patients had tuberculosis of the adrenal glands. While Addison's six patients in 1855 all had adrenal tuberculosis, the term "Addison's disease" does not imply an underlying disease process. 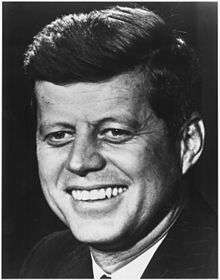 John F. Kennedy, the 35th President of the United States, was one of the best-known people with Addison's disease and was possibly one of the first to survive major surgery. Substantial secrecy surrounded his health during his years as president. Eunice Kennedy Shriver, one of John F. Kennedy's sisters, was believed to have Addison's disease as well. Scientist Eugene Merle Shoemaker, co-discoverer of the Comet Shoemaker-Levy 9. American artist Ferdinand Louis Schlemmer died from Addison's disease. Some have suggested Jane Austen was an avant la lettre case, but others have disputed this. According to Carl Abbott, a Canadian medical researcher, Charles Dickens may also have been affected. Osama bin Laden may have had Addison's. Lawrence Wright noted that bin Laden exhibited the key symptoms of Addison's, including "low blood pressure, weight loss, muscle fatigue, stomach irritability, sharp back pains, dehydration, and an abnormal craving for salt". Bin Laden was also known to have consumed large amounts of sulbutiamine to treat his symptoms. Basque nationalist and founder of the Basque Nationalist Party, Sabino Arana died in Sukarrieta at the age of 38 after falling ill with Addison's disease during time spent in prison. One of Canada's top gymnasts, Nathan Gafuik, was diagnosed with Addison's disease when he was 15. The condition has been diagnosed in all breeds of dogs. In general, it is underdiagnosed, and one must clinically suspect it as an underlying disorder for many presenting complaints. Females are overrepresented, and the disease often appears in middle age (4–7 yr), although any age or either gender may be affected. Hypoadrenocorticism is treated with fludrocortisone or a monthly injection called Percorten V (desoxycorticosterone pivlate (DOCP)) and prednisone. Routine blood work is necessary in the initial stages until a maintenance dose is established. Most of the medications used in the therapy of hypoadrenocorticism cause excessive thirst and urination, making it important to provide enough drinking water. If the owner knows about an upcoming stressful situation (shows, traveling, etc. ), patients generally need an increased dose of prednisone to help deal with the added stress. Avoidance of stress is important for dogs with hypoadrenocorticism. 1 2 3 4 5 6 7 8 9 10 11 12 13 "Adrenal Insufficiency and Addison's Disease". NIDDK. May 2014. Retrieved 13 March 2016. 1 2 Adam, Andy (2014). Grainger & Allison's Diagnostic Radiology (6 ed.). Elsevier Health Sciences. p. 1031. ISBN 9780702061288. ↑ Napier, C; Pearce, SH (June 2014). "Current and emerging therapies for Addison's disease.". Current opinion in endocrinology, diabetes, and obesity. 21 (3): 147–53. doi:10.1097/med.0000000000000067. PMID 24755997. ↑ Napier, C; Pearce, SH (December 2012). "Autoimmune Addison's disease.". Presse medicale (Paris, France : 1983). 41 (12 P 2): e626–35. doi:10.1016/j.lpm.2012.09.010. PMID 23177474. 1 2 Brandão Neto, RA; de Carvalho, JF (2014). "Diagnosis and classification of Addison's disease (autoimmune adrenalitis).". Autoimmunity reviews. 13 (4-5): 408–11. doi:10.1016/j.autrev.2014.01.025. PMID 24424183. 1 2 3 4 5 6 7 8 Ten S, New M, Maclaren N (2001). "Clinical review 130: Addison's disease 2001". The Journal of Clinical Endocrinology and Metabolism. 86 (7): 2909–2922. doi:10.1210/jc.86.7.2909. PMID 11443143. ↑ Nieman LK, Chanco Turner ML (2006). "Addison's disease". Clinics in Dermatology. 24 (4): 276–280. doi:10.1016/j.clindermatol.2006.04.006. PMID 16828409. ↑ de Herder WW, van der Lely AJ (May 2003). "Addisonian crisis and relative adrenal failure". Reviews in Endocrine and Metabolic Disorders. 4 (2): 143–7. doi:10.1023/A:1022938019091. PMID 12766542. ↑ "Addison's Disease". National Endocrine and Metabolic Diseases Information Service. Retrieved 26 October 2007. ↑ Winqvist O, Karlsson FA, Kämpe O (June 1992). "21-Hydroxylase, a major autoantigen in idiopathic Addison's disease". The Lancet. 339 (8809): 1559–62. doi:10.1016/0140-6736(92)91829-W. PMID 1351548. ↑ Husebye ES, Perheentupa J, Rautemaa R, Kämpe O (May 2009). "Clinical manifestations and management of patients with autoimmune polyendocrine syndrome type I". Journal of Internal Medicine. 265 (5): 514–29. doi:10.1111/j.1365-2796.2009.02090.x. PMID 19382991. ↑ Laureti S, Casucci G, Santeusanio F, Angeletti G, Aubourg P, Brunetti P (1996). "X-linked adrenoleukodystrophy is a frequent cause of idiopathic Addison's disease in young adult male patient". The Journal of Clinical Endocrinology and Metabolism. 81 (2): 470–474. doi:10.1210/jc.81.2.470. PMID 8636252. ↑ Quinkler M, Dahlqvist P, Husebye ES, Kämpe O (Jan 2015). "A European Emergency Card for adrenal insufficiency can save lives". Eur J Intern Med. 26 (1): 75–6. doi:10.1016/j.ejim.2014.11.006. PMID 25498511. 1 2 3 Michels A, Michels N (1 Apr 2014). "Addison disease: early detection and treatment principles". Am Fam Physician. 89 (7): 563–8. PMID 24695602. ↑ White, Katherine (28 July 2004). "What to do in an emergency -Addisonian crisis". Addison's Disease Self Help Group. ↑ "Adrenal Insufficiency and Addison's Disease". National Endocrine and Metabolic Diseases Information Service. Retrieved 26 November 2010. ↑ "Addison Disease". MedicineNet. Archived from the original on 24 June 2007. Retrieved 2007-07-25. 1 2 Odeke, Sylvester. "Addison Disease". eMedicine. Archived from the original on 7 July 2007. Retrieved 2007-07-25. ↑ Volpé, Robert (1990). Autoimmune Diseases of the Endocrine System. CRC Press. p. 299. ISBN 0-8493-6849-9. ↑ "Addison's disease - Treatment". NHS Choices. Retrieved 2016-10-08. ↑ Bergthorsdottir, Ragnhildur; Leonsson-Zachrisson, Maria; Odén, Anders; Johannsson, Gudmundur (2006-12-01). "Premature Mortality in Patients with Addison's Disease: A Population-Based Study". The Journal of Clinical Endocrinology & Metabolism. 91 (12): 4849–4853. doi:10.1210/jc.2006-0076. ISSN 0021-972X. ↑ Dimitrios Chantzichristos; Anders Persson; Björn Eliasson; Mervete Miftaraj; Stefan Franzén; Ragnhildur Bergthorsdottir; Soffia Gudbjörnsdottir; Ann-Marie Svensson; Gudmundur Johannsson (2016-04-01). Cushing Syndrome and Primary Adrenal Disorders. Meeting Abstracts. Endocrine Society. pp. OR25–4–OR25–4. doi:10.1210/endo-meetings.2016.ahpaa.9.or25-4. ↑ Addison, Thomas (1855). On The Constitutional And Local Effects Of Disease Of The Supra-Renal Capsules. London: Samuel Highley. ↑ Patnaik MM, Deshpande AK (May 2008). "Diagnosis–Addison's Disease Secondary to Tuberculosis of the Adrenal Glands". Clinical Medicine & Research. 6 (1): 29. doi:10.3121/cmr.2007.754a. PMC 2442022 . PMID 18591375. ↑ Bishop PM (1950). "The history of the discovery of Addison's disease". Proceedings of the Royal Society of Medicine. 43 (1): 35–42. PMC 2081266 . PMID 15409948. ↑ Nicholas JA, Burstein CL, Umberger CJ, Wilson PD (November 1955). "Management of adrenocortical insufficiency during surgery". JAMA Surgery. 71 (5): 737–742. doi:10.1001/archsurg.1955.01270170095018. PMID 13268224. ↑ Lord Owen (May 2003). "Diseased, demented, depressed: serious illness in Heads of State". QJM. 96 (5): 325–36. doi:10.1093/qjmed/hcg061. PMID 12702781. ↑ Dallek, Robert (2003). An Unfinished Life: John F. Kennedy, 1917-1963. London: Penguin Books. pp. 105, 731. ISBN 978-0-14-101535-4. ↑ "The Australian Addison's Disease Association". Retrieved 2007-07-25. ↑ Marsden, Brian (1997-07-18). "Eugene Shoemaker (1928-1997)". Comet Shoemaker-Levy Collision with Jupiter. Jet Propulsion Laboratory. Archived from the original on 11 July 2007. Retrieved 2007-07-25. ↑ Jones, Terry. "Patron Saints Index: Blessed Elizabeth of the Trinity". Archived from the original on 11 May 2008. Retrieved 2008-05-04. ↑ Upfal, Annette (2005). "Jane Austen's lifelong health problems and final illness: New evidence points to a fatal Hodgkin's disease and excludes the widely accepted Addison's". Medical Humanities. BMJ Publishing Group. 31 (1): 3–11. doi:10.1136/jmh.2004.000193. ↑ Williams, Linda; Hawes, Donald; Brake, Laurel (1991). "The Nineteenth Century: Victorian Period". The Year's Work in English Studies. Oxford University Press. 72 (1): 314–360. doi:10.1093/ywes/72.1.314. ↑ Chersterton, Ray (11 May 2007). "The cruelty of sport". The Daily Telegraph. Retrieved 2 January 2012. ↑ Wright, Lawrence (2006). The Looming Tower. New York City: Knopf. p. 139. ISBN 978-0-375-41486-2. ↑ "Addison's disease makes Gafuik a fighter". The Globe and Mail. 20 July 2012. Retrieved 20 July 2012.